MITZPE RAMON, ISRAEL–Every time I visit the British Museum in London, I examine the fascinating relief from Nineveh showing The Siege of Lachish. The detail is extraordinary as the story is told in sequence through dozens of panels. It is a brutal tale of conquest and pillage, giving insights into the heart of an empire long since extinct. Today Will and I visited the archaeological site of Lachish on the way back from Jerusalem. Our friend Yoav gave us an excellent tour — and we were the only people there. The main gate and approach road is shown in the image above. Lachish was a walled city at the boundary between the hill country and the coastal plain. It is mentioned several times in the Bible, most notably when captured by Joshua from the Canaanites (see Joshua 10: 1-32). The famous Siege of Lachish was in 701 BCE when the Assyrian king Sennacherib sought to conquer the tiny nation of Judea (see II Kings 18). Lachish watched over the coastal plain and the main approaches to Jerusalem. The city wall on the approach to the main gate. 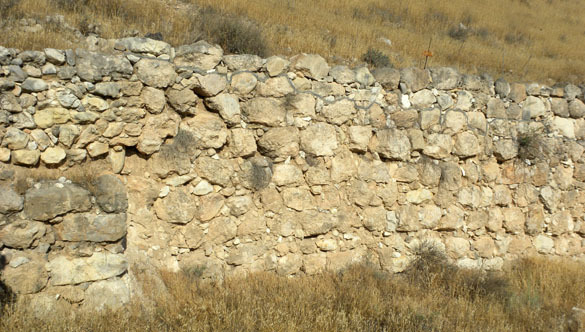 Soldiers marching up the road would have their right sides exposed to this wall. Since they typically carried their shields on their left arms, they are here vulnerable to defending archers at the top of the wall. 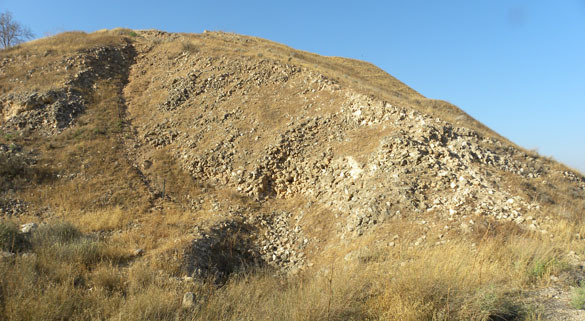 The Assyrians did not attack Lachish directly by the main gate. They instead built a siege ramp of stones and wood on the weakest corner of the walled city. They wheeled battering rams and towers up this ramp, eventually breaching the wall despite a counter-ramp attempted by the Judean defenders. This is one of the best preserved siege ramps in the ancient Near East. A view of the inside of the city showing remnants of the commander’s palace at the highest point. The view from Lachish into the Judean Hills. Hebron is visible at the top of the distant ridge. An archaeological controversy (or at least it should be one) is this well in or near the city walls of Lachish. Geologists have shown conclusively that it was a failed well — it did not reach the aquifer (Weinberger et al., 2008). 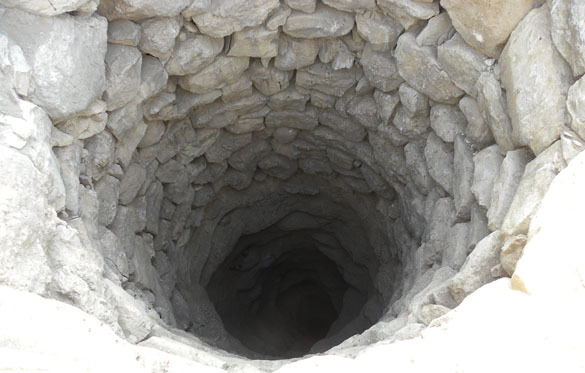 The builders of the well may have thought that all they had to do was penetrate down as far as the wells outside the city to hit water, but those wells were in a perched aquifer of alluvium. The Lachish well is in Eocene chalk. The city may have been running out of water when it was besieged. It was a privilege to visit such an historic site and have the luxury of a personal guided tour by Yoav. Weinberger, R., Sneh, A. and Shalev, E. 2008. Hydrogeological insights in antiquity as indicated by Canaanite and Israelite water systems. Journal of Archaeological Science 35: 035-3042. Our visit to Jerusalem was to meet geologists at the Geological Survey of Israel main complex in the western part of the city. Those discussions went very well and we met new people and learned much. Will and I also took the opportunity to spend a few hours in the Old City. Here are some of the sites. The view above is of the Old City from Mount Scopus. 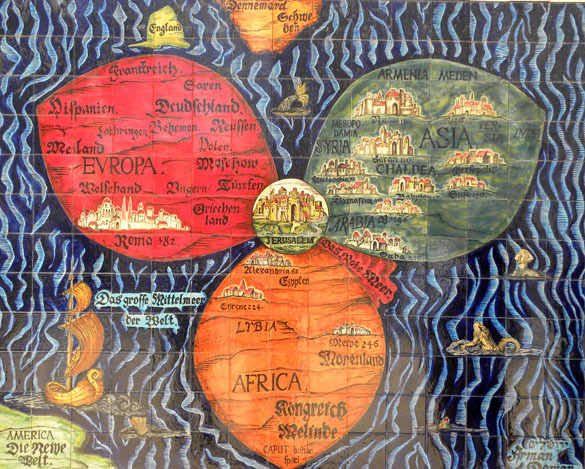 When we say that Jerusalem is the “Center of the World“, we are following a medieval tradition illustrated by this European manuscript page reproduced as a tiled image at the City Hall. 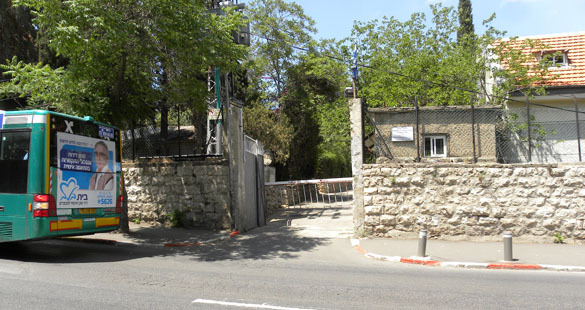 The Geological Survey of Israel headquarters have a very unassuming (and secure) entrance. This is an old World War II British military base that was on the outskirts of the city but is now surrounded by an Ultra-Orthodox Jewish community. It is a wise move not to advertise the very secular activities going on in there! 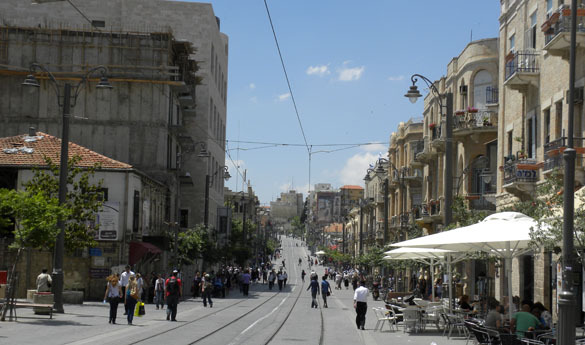 Our main walking route from the Survey to the Old City was Jaffa Street, which leads directly to Jaffa Gate. This is looking northwest. There is a new tram system being tested, thus the tracks in the road and lack of cars. Will in the Old City market on our way to the Church of the Holy Sepulchre. Outer courtyard of the Church of the Holy Sepulchre. All those people going in and out of that one doorway. 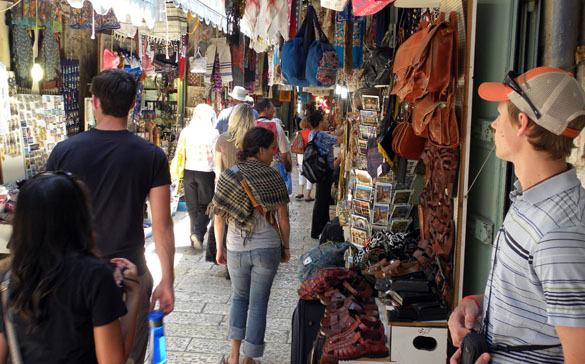 Jerusalem now receives a record three million visitors a year. 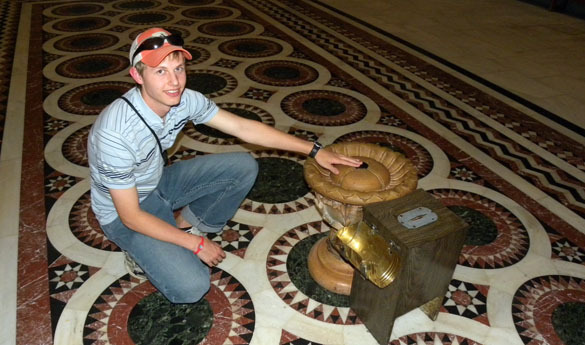 Turns out the Center of the World is actually within the Church of the Holy Sepulchre … and its exact spot has been marked! 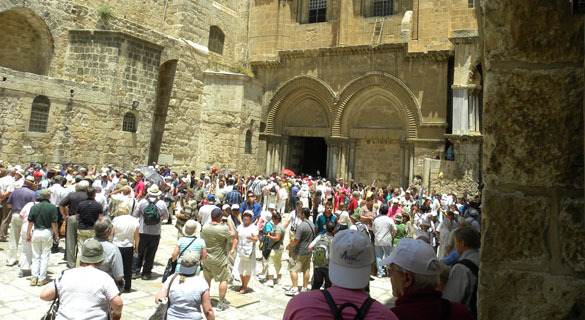 There are very few places in the Church of the Holy Sepulchre where you can see the original bedrock of the area. 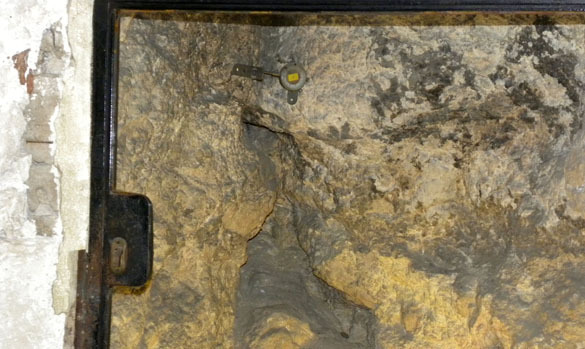 This is a famous crack in the rock below what is supposed to be the crucifixion site and above what is known as Adam’s Grave. Note the strain gauge across the joint. There are geological concerns about the stability of the bedrock and monumental structures built on top of it. I can’t imagine how the Israeli authorities got religious sanction to install that instrument! 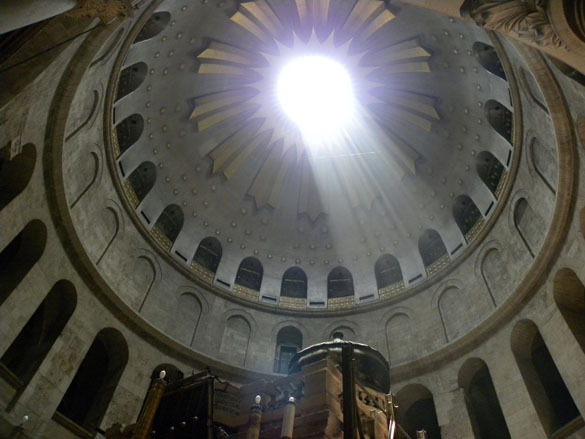 Crepuscular rays descending from the dome of the Church of the Holy Sepulchre. The top of the Holy Sepulchre structure is at the bottom of the image. 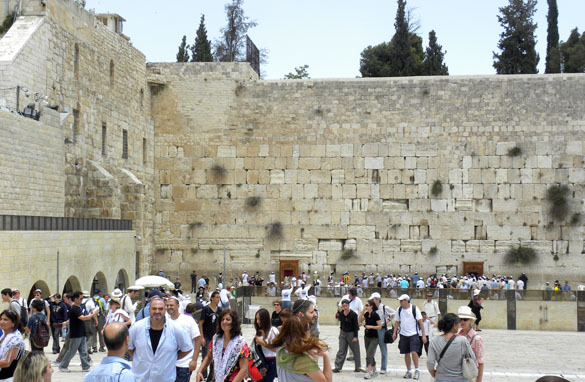 Finally, we visited the Western Wall revered in Judaism. Above it (and not visible in this image) are the Islamic holy sites in Jerusalem: the Al Aqsa Mosque and the Dome of the Rock. We thus visited in the space of a few hours sacred spaces of the three Abrahamic religions. Center of the World indeed. MITZPE RAMON, ISRAEL–Today Will and I went to Jerusalem for meetings at the Geological Survey of Israel headquarters. Much more on that later. On the way Yoav drove us along the west coast of the Dead Sea. Will got a chance to dip his hand in the warm and heavy water, and we talked about salt, shorelines and sinkholes. 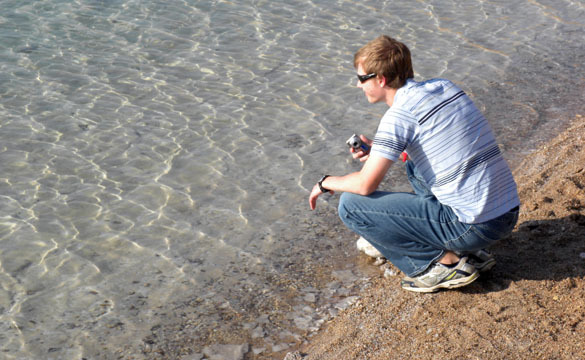 These are halite (salt) deposits on the Dead Sea shore near Will’s feet above. 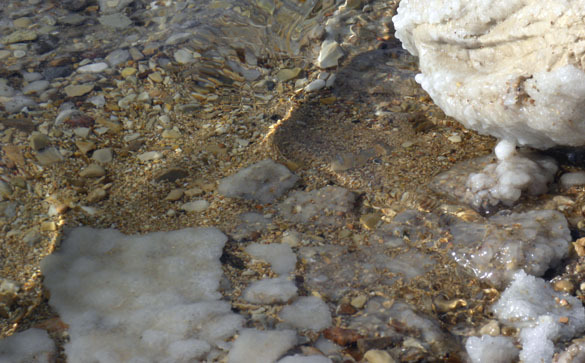 Halite encrusts all that this water touches, from rocks and sediment to abandoned tires. 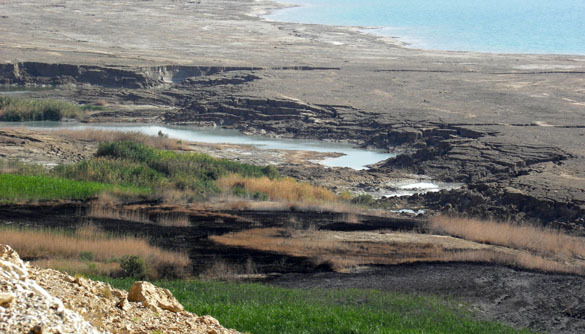 This slope above the highway on the west shore of the Dead Sea shows ancient shorelines from roughly 26,000 to 14,000 years ago. The sea then was salty but only about half the current salinity. Shorelines fluctuated but generally fell during this 12,000 year interval. A serious environmental problem along the western shore is the development of huge sinkholes. These are forming because the Dead Sea is losing water rapidly (it drops about a meter per year) and freshwater is now finding thick salt deposits underground. The water dissolves the salts, forming caverns that eventually collapse and make the pits above. Often the pits then fill with water, making small ponds that have their own flora and fauna.